Glass beads and beadmaking waste have been excavated at the Iron Age site of Jiuxianglan (ca. third century BC–eighth century AD) in southeastern Taiwan. It was suggested that this site may be a production and exchange centre of glass beads in Iron Age Taiwan. This paper presents the analysis of 44 samples, to explore the relationship between glass beads and waste and the nature of bead production at Jiuxianglan. The analysis combines data on style, chemical composition, microstructure and distribution of glass beads and waste. The results do not show a compositional or structural match between the glass beads and glass waste, suggesting that the glass beads may not have been produced at this site. The online version of this article ( https://doi.org/10.1007/s12520-017-0593-3) contains supplementary material, which is available to authorized users. Jiuxianglan (舊香蘭) is located on the south bank of the estuary of the Taimali Stream in southeastern Taiwan (Fig. 1). C-14 dating has shown an occupation period between the third century BC and eighth century AD (Lee 2005b: 168; 2010: 30–31; 2015b: 182–183). The rescue excavations in the early 2000s show it was occupied by the Iron Age Sanhe Culture (三和文化) (see Liu et al. 1994 and Liu 2011: 248–251 for reference to the Sanhe Culture), which is characterised by the presence of iron artefacts, glass beads and pottery with triangular handles and punch-dotted motifs, which were found at the site (Lee 2010: 171–183). In addition, the vessel shapes and motifs of some funerary pottery found from Jiuxianglan are similar to those found in the Guishan Culture in southernmost Taiwan (Lee 2010: 182–183), which may indicate some interaction or cultural affinities to the cultures in southern Taiwan. The presence of significant numbers of glass beads and Southeast Asian style sandstone moulds may suggest interaction with contemporary Southeast Asia. The physical appearance of the glass beads from Jiuxianglan resembles the monochrome glass beads from the Indo-Pacific (e.g. Francis 2002, colour plate 9; Hung and Bellwood 2010: 242; Lankton et al. 2003: 69). The excavations at Jiuxianglan also found bivalve sandstone moulds used for casting objects in bronze and possibly precious metals, and it has been suggested that the style of these casting moulds is similar to clay-made moulds found in Southeast Asia (Hung and Bellwood 2010; Hung and Chao 2016), although investigation of the sandstone used to produce the moulds indicates this raw material was procured locally in southern Taiwan (Yang et al. 2012). One of the striking finds at Jiuxianglan was the first reported evidence for pyrotechnology relating to glass beadmaking in Iron Age Taiwan (Lee 2005b, 2007). This includes small fragments of glass rods, a mandrel encircled with a glass bead, fused glass and glass beads attached together. In addition to the glass beadmaking waste, around 2800 glass beads (intact beads or fragments) were unearthed from Jiuxianglan in the first excavation session (Lee 2005a, b; Wang 2016: 112). Except for two polychrome beads, all the remaining glass beads are monochrome, in red, orange, yellow, green, blue and black. A furnace-like circular structure built of gravel, together with burned soil areas, in proximity to the glass finds is thought to be associated with ‘pyrotechnological activities’ (Lee 2010: 29). This evidence together has led to speculation among Taiwan archaeologists that Jiuxianglan may be a centre of glass beadmaking and hence glass bead exchange with other cultures. To date, no detailed chemical and microstructural analyses have been done on the glass from Jiuxianglan to support this assumption. Therefore, this paper presents the first analytical study of the glass from the site, combining typology, chemical composition and microstructure to understand the relationship between the glass waste and the beads found at Jiuxianglan. Forty-four samples including 36 beads and 8 waste samples (rods, chips and chunks) were selected for analysis (Table 1). Twenty-two of the glass beads (JXL01-JXL22) were from the same trench T3P35 (Fig. 1 and Table 1; each trench is 2 m in width and 2 m in length. ), where a tentative chronological sequence is proposed based on the styles of pottery handles (Lee 2005b: 159–160). T3P35 is near the gravel furnace-like structure, which partially overlaps with the trench where the glass beads were unearthed. The 22 beads were analysed to test any temporal changes in glass typology or chemical composition based on the samples from a single trench. There is no absolute dating for the trench T3P35. However, new C-14 data for nearby trenches T4P35 and T4P36 (Fig. 1) have reported in Lee (2015b: 183), suggesting an early and continuous occupation around 2150-1570BP (2 sigma calibrated results). In the southern trenches T3P37 and T3P39, the C-14 dating has shown a later chronology of 1730-1330BP and 1261-1137BP (2 sigma calibrated results) respectively (Lee 2015b: 183). The dating suggests the northern deposition may be of an earlier date and the southern areas may be later. As permission was granted to sample only a limited number of beads, to increase the total sample size, 14 other beads were selected from the other trenches (n = 5), an Iron Age burial (n = 1) and surface collections at the site (n = 8) (Table 1). Eight glass waste samples were selected from three trenches near the possible furnace structure to investigate the relationship between glass beads and waste and to assess the supposition that glass beads were produced at Jiuxianglan. Optical microscopic observation was used to investigate (1) the manufacturing technique used for producing the finished glass beads sampled in this research and (2) the possible glass beadmaking method evidenced by the glass waste. Evaluation of the bead production method is based on the ‘fabric’ lines left on the bead surface, which may show traces resulting from the pulling of molten glass tubes (the drawn technique) or coiling of glass rods (the wound technique) (van der Sleen 1967: 24). In drawn beads, the fabric lines and elongated bubbles are parallel to the perforation axis, while in wound beads the fabric lines and bubbles encircle the perforation axis. Three methods were used for the chemical and microstructural analysis: scanning electron microprobe equipped with energy dispersive spectrometer (SEM-EDS) for the microstructural analysis, electron probe microanalyser (EPMA) for the quantitative analysis of major and minor elements, and laser ablation–inductively coupled plasma–mass spectrometer (LA-ICP-MS) for the trace elemental analysis. The SEM-EDS and EPMA analyses were undertaken in the EPMA Lab in the Institute of Earth Sciences, Academia Sinica, Taiwan. LA-ICP-MS analysis was carried out in the Department of Biomedical Engineering and Environmental Sciences, National Tsing Hua University, Taiwan. All the samples selected were cut from bead fragments to get a fresh cross-section. These were then mounted in epoxy and vacuum degassed to get rid of the small bubbles. The epoxy blocks were ground and polished with diamond suspension down to 1 μm and then carbon coated for electron microprobe analysis. For LA-ICP-MS analysis, the coated carbon layer was removed prior to the analysis. The operational parameters for SEM-EDS (JEOL FE-SEM: JSM-7100F, with Oxford EDS) are the accelerating voltage of 15 kV, the probe current of 0.1 nA and the working distance of 10 mm. The stability of beam current is routinely checked with a probe current detector. Quantitative compositional analysis was carried out by EPMA (JEOL JXA-8500F) equipped with wavelength dispersive spectrometer (WDS). Fifteen elements are reported here, namely Si, Al, Na, K, Mg, Ca, Fe, Pb, Ba, Ti, Mn, Cu, Sn, Cl and S, reported as oxides except for Cl. The analytical parameters are, accelerating voltage of 12 kV, beam current of 6 nA and the beam diameter of 5 μm. A defocused beam was used to avoid the migration of alkalis in the glass in the bombarded area due to the beam current damage. Linear transverse EPMA analysis was used. Analytical spots were selected across the glass matrix, and voids and mineral remains in the sample were avoided. Data collected close to the bead surface were also ruled out to avoid areas of weathering or corrosion. The LA-ICP-MS analysis was carried out using an ICP-MS spectrometer (Agilent 7500a, USA) in conjunction with a New Wave UP213 laser ablation system, combined with an Nd:YAG laser at wavelength of 213 nm. The analytical protocol follows Dussubieux et al. (2009). Single spot analysis was used with a beam diameter of 55 μm, a laser energy at around 70% of 0.2 mJ, the pulse frequency of 15 Hz and the pre-ablation time of 20s. In each sample, 4 points were analysed. The calculation of elemental concentration uses the method proposed by Gratuze (1999), and Si-29 was used as internal standard. Here, the reported elements analysed by LA-ICP-MS include Sc, V, Co, Ni, Zn, As, Rb, Sr, Y, Zr, Nb, Ag, Sb, Cs, La, Ce, Pr, Nd, Sm, Eu, Gd, Tb, Dy, Ho, Er, Tm, Yb, Lu, Hf, Th and U.
Corning A, B, C, D and NIST610, 612, 621 were used to determine the calibration curve of LA-ICP-MS analysis; for elemental concentrations not provided in the original certified value, the data from Pearce et al. (1997) were used. The limit of detection was calculated as three times the standard deviation of the measured blanks. The standards mentioned above were also used for monitoring the precision (the repeatability of measured data) and accuracy (the conformity of the measured composition to the true composition) of the EPMA and LA-ICP-MS analysis. The precision is evaluated by the relative standard deviation (RSD). For the EPMA results, the RSD is lower than 4% for major elements, while in minor elements the RSD is lower than 20%. In LA-ICP-MS, the RSD for most of the elements analysed is lower than 8% (except for Sb2O5 in Corning C and NIST 612, with RSD ~ 29 and 16%, respectively). In terms of the accuracy, in EPMA the relative accuracy error of major elements varies from − 5.3 to 3.0%, and the measured value of K2O is always slightly lower than that reported in the Corning standards. As for minor elements, the relative accuracy is generally between − 60.4 and 58.7%. The measured value of MnO in Corning C shows a large relative accuracy error of − 96.8% (with a measured value of 0.03%) compared to that reported in Vicenzi et al. (2002, 0.82%). In fact, varied values of MnO in Corning C were reported, and a low MnO content of around 0.001% is also reported in Dussubieux et al. (2009) and Wagner et al. (2012). The relevant discussion can be found in Wagner et al. (2012). In LA-ICP-MS, the relative accuracy error for the trace elements it is between 33 and − 30%. The relative accuracy error of Sb2O5 is particularly high in Corning C, which may be due to the overestimation of the recommended value in Brill (1999: 544). A relatively low value of Sb2O5 is reported in Dussubieux et al. (2009) (0.00014%) and Wagner et al. (2012) (0.0001%), and in this research the Sb2O5 is measured as 0.0006% in Corning C.
The optical microscopic investigation revealed that 33 of the 36 beads are probably drawn. Figure 2 shows some bead samples with evidence of the drawn method where the parallel fabric lines, elongated bubbles and voids can be seen clearly on the surface. The manufacturing method of one green bead, JXL26, is hard to determine simply through the exterior surface, but further examination on the perforation and interior body reveals a few encircling fabric lines, and therefore may suggest the use of the wound method. The manufacturing method for the remaining two blue beads (JXL06 and JXL29, Fig. 2) could not be determined through microscopic observation. In the red beads, blackish streaks are often noticed, and in the green beads, yellowish streaks can be seen. The optical microscopic examination clearly indicates that these blackish or yellowish streaks are not intentionally added on the bead surface for decoration, as they can also be observed from the interior body through the fragmented surface and are therefore a result of the drawn manufacturing method used (JXL01 and JXL11, Fig. 2). In the green bead, this is probably the result of an uneven distribution of the colourant used, based on the chemical and microstructural analysis (Wang 2016: 173–175). In terms of the red heterogeneities, no distinct chemical and microstructural differences can be seen with SEM-EDS despite these being visibly distinct, suggesting that more scientific analysis, and possibly experimentation, is required to understand the mechanisms between the red and blackish areas. In terms of the glass waste, it can be seen from Fig. 2 that the shapes of the waste do not suggest the use of the technique, described by Francis (1990), used for producing drawn beads in the Indo-Pacific region. None of the waste resembles specific artefacts or features of this type of production, for example, the ‘horns’, the ‘pulled tubes’ and the ‘caught knots’ suggested by Peter Francis as indicative evidence of the drawn method (Francis 1990). Similarly, there are no remains of glass tubes found at Jiuxianglan which would be expected if the drawn method was used. Figure 2 shows JXL46, JXL47 and JXL48 are all glass rods rather than tubes. The image of JXL46 further shows the stretched pulled-off end of the glass rod. This lack of waste indicative of drawn beads and the absence of tubes, along with the presence of glass rods together with the bead encircling the tip of a mandrel (shown in Lee 2005a), suggests it is more likely that the wound method rather than drawn method was used for bead production at Jiuxianglan. Therefore, the identification of the wound method from glass waste shows an inconsistency with the examined finished glass beads, which were made using the drawn method. In the 44 glass samples analysed, 40 are mineral-soda-alumina (m-Na-Al) glass (Fig. 3, Tables 2 and 3), with Na2O greater than 15 wt%, Al2O3 between 6 and 15 wt% and MgO less than 2 wt% in the base composition. Three samples are soda plant ash glass (v-Na-Ca glass, v=vegetal), having Na2O at a similar level to the m-Na-Al glass, but Al2O3 contents are less than 5 wt% and MgO between 3 and 6 wt%. There is only one potash glass identified in this research, with K2O 15 wt%, Al2O3 2 wt% and MgO less than 1 wt% (see Dussubieux and Gratuze (2010) and Wang and Jackson (2014) for a review of these compositions). All but one of the glass beads analysed here have an m-Na-Al composition (n = 35, Fig. 3). The other glass bead is a potash glass. All the samples selected from the single trench (JXL01-JXL22) are m-Na-Al glass with an extremely consistent composition, the only significant compositional differences being the added colourants. As for the glass waste, five samples are m-Na-Al glass and three are v-Na-Ca glass. This contrasts with the beads analysed where there are no examples of v-Na-Ca glass. Moreover, the chemical composition and/or microstructure of m-Na-Al glass waste also does not always show similarities to the m-Na-Al glass beads; these anomalies are discussed below. Further investigation of the yellow m-Na-Al glass beads (n = 9) and waste (n = 1), has shown that all the yellow glass beads (excluding JXL20) have similar levels of CaO (~ 2.5 wt%), Ba (~ 0.25 wt%) and Sr (~ 700 ppm), but the one yellow m-Na-Al glass waste fragment (JXL48) has lower concentrations of CaO (1.7 wt%), Ba (0.13 wt%) and Sr (400 ppm) (Fig. 4). JXL20 is regarded as an outlier here, as the Ba and Sr concentrations are much lower than other yellow bead samples (Table 2). The yellow glasses have elevated level of Sr. Although this may suggest a marine carbonate source (Freestone et al. 2003), the relationships between the CaO, Sr and Ba in the yellow glass suggest marine carbonates may not be the dominant contributor of the elevated level of Sr seen here. The microstructural analysis on the m-Na-Al glass from Jiuxianglan has suggested that the granitic sand used in the glass production is rich in plagioclase, which may introduce a few percent of CaO and a few hundred ppm of Ba and Sr to the bulk composition of glass (Wang et al. submitted). Thus the increased concentrations of Sr may also derive from the plagioclase in the sand. Moreover, the CaO concentration at less than 3 wt% does not suggest an additional source of crushed shell was introduced into the primary glass during production. However, despite this the Ba and Sr contents in the yellow glass beads from Jiuxianglan are higher than the average level of Ba (420–840 ppm) and Sr (100–400 ppm) in granitic rocks (Mielke 1979), and therefore may indicate some other additional sources of Ba and Sr in the yellow glass beads as this does not fully explain this high concentration of these elements. It is tentatively suggested that some of the Ba, and possibly Sr, in the yellow glass beads may be introduced as impurities of a Pb-containing ingredient used as a colourant, as these yellow glass beads are coloured by lead tin oxide, and lead ores such as galena (PbS) often precipitates with barite (BaSO4) and/or celestine (SrSO4) (Wang 2016: 145–148). In the yellow glass beads, a PbO/Ba ratio of less than 18 is found, while in the yellow glass waste the PbO/Ba ratio is 45. This may suggest that different raw materials, bead origins or recipes specifically related to the colouring of the beads were used in the production of yellow glass beads and the waste found at Jiuxianglan, although all were coloured and opacified by lead tin oxide. Further investigation on the PbO-SnO2 relationship in this material indicates different mixes or recipes of colourants were used in the glass beads and glass waste. The yellow glass beads contain less than 4 wt% PbO and 0.4 wt% SnO2 (with a variable PbO/SnO2 ratio between 10 and 45), while the yellow glass waste has greater PbO of around 6 wt% and SnO2 of 0.6 wt% (Fig. 5). It is therefore likely that the yellow glass beads and waste from Jiuxianglan were not coloured using the same source or mixture of colourant. This further indicates that the yellow glass beads from Jiuxianglan are not locally produced and the glass waste analysed in this research is unrelated to the beads. One yellow glass bead is made of potash glass. Microstructural investigation has revealed that this glass may have been a green glass originally, and the outer yellowish colour is a result of weathering (Wang et al. submitted). The lack of potash glass waste means that it is not possible to investigate whether this bead may have been locally produced at Jiuxianglan. The light blue glass is coloured by CuO. All the light blue glass beads (n = 8) are m-Na-Al glass, 2 light blue glass waste fragments are m-Na-Al glass and 1 light blue waste fragment is v-Na-Ca glass. The dark blue waste has a v-Na-Ca composition, coloured by cobalt (770 ppm) and shows a homogeneous matrix. Unfortunately, permission was not given to analyse any dark blue glass beads in this research. The chemical composition of the m-Na-Al glass does not show significant differences between light blue glass beads and waste. However, it is noteworthy that the two light blue m-Na-Al glass waste fragments have a different microstructure to the light blue beads. Although the matrix of the light blue glass bead is more homogeneous compared to other bead colours, the light blue beads contain bubbles, un-melted minerals (such as silica, feldspar and zircon) and sometimes exhibit an uneven chemical distribution of glass matrix (localised inhomogeneity) (Fig. 6a, b). In contrast, the glass matrix of the m-Na-Al glass waste is relatively homogeneous with the absence of bubbles and almost no un-melted silica or feldspar relics (Fig. 6c, d). Figure 2 also clearly shows that the light blue m-Na-Al glass waste (JXL39 and JXL44) is visibly transparent, but the beads are opaque. One light blue glass waste fragment (JXL46) has a v-Na-Ca composition, but no beads of v-Na-Ca glass were found in this analysis. This light blue glass waste fragment shows a homogeneous matrix without any obvious mineral remains. These factors taken together may suggest the light blue beads (all m-Na-Al glass) and waste (m-Na-Al or v-Na-Ca composition) from Jiuxianglan are not related. Two aqua glass waste fragments were analysed, and both are m-Na-Al glass. The two aqua glasses reveal slightly different compositions – JXL41 has 0.2 wt% CuO and 1.2 wt% FeO, while JXL49 has negligible amounts of CuO and FeO. The two samples are fully transparent, with no silica relics but a few zircons. The lack of bubbles and silica relics shows that the microstructure of the aqua glass waste does not resemble the microstructure of the glass beads (in other colours) from Jiuxianglan. Although one can argue that the aqua glass could be used as a base glass for the addition of colouring compounds in order to produce different coloured beads, there are no supporting archaeological finds related to colouring at the site, nor aqua coloured beads, and the microstructure suggests a fully melted glass, with few relics, which is unlike most of the beads analysed. The six red glass beads analysed are all m-Na-Al glass, while the single red glass waste rod has a v-Na-Ca composition (Fig. 3). The significant difference between the base glass compositions of the red beads and waste indicates that the glass beads were not made using the glass represented by the red waste at Jiuxianglan, despite both the beads and waste showing a similar microstructure, with copper sulphide particles of around 10 μm distributed within the glass matrix (Wang et al. submitted). The minor and trace elemental patterns in the red beads and waste also shows some differences. Zr is higher in the glass beads, at around 300–600 ppm, which is typical of m-Na-Al glass, while in the red v-Na-Ca glass waste rod a Zr content as low as 60 ppm is detected. In the red v-Na-Ca glass waste, higher concentration of Sb (110 ppm) and Mn (0.5 wt%) are found, compared to the red beads made of m-Na-Al glass (Sb < 20 ppm and Mn < 0.1 wt%). This difference is frequently observed between the v-Na-Ca and m-Na-Al glass in Iron Age samples from Taiwan, and whether this is related to the differences in raw materials or production process between m-Na-Al and v-Na-Ca glass is not yet known (Wang 2016: 191). However, the different glass compositions of red beads of an m-Na-Al composition and the red waste which has a v-Na-Ca composition analysed here has demonstrated that these red glass beads do not derive from the waste found. No orange glass waste was found at Jiuxianglan. Three orange glass beads were analysed and all have an m-Na-Al glass composition. It is noted that, although the orange and red glass bead are all probably coloured by cuprite, the CuO wt% in the orange glass (5–8 wt%) is much higher than that in the red glass (< 2 wt%), which may suggest that a larger amount of copper-containing raw materials was used for producing orange glass. Elevated concentrations of PbO and SnO2 are also found in the orange glass (PbO 1–1.5 wt% and SnO2 0.4–1.3 wt%) compared to the red glass (PbO < 1 wt% and SnO2 < 0.1 wt%), which may suggest different sources of copper-containing raw materials used in colouring the red and orange glass beads excavated at Jiuxianglan (Wang et al. submitted). Nine green glass beads were analysed, and all are m-Na-Al glass, coloured by copper oxide and lead tin oxide, with CuO of 0.5–1.5 wt%, PbO of 2–6 wt% and SnO2 < 0.5 wt%. The CuO is detected in the matrix by EDS analysis, while the crystals of lead tin oxide are distributed throughout the matrix, which corresponds to the yellow streaks observed under the optical microscope (Wang 2016: 173–175). This suggests the green colour may be a result of mixing blue (coloured by copper) and yellow colourants, and the opacity derived from the lead tin oxide. Unfortunately, although green glass waste was found on site, no sampling of this waste was permitted for this research, and therefore it is not possible to compare the chemical compositions and microstructure of the green glass beads and waste. The results presented show that the manufacturing processes are different for the beads and that evidenced in the glass waste. The presence of drawn beads, but glass waste showing relics of manufacture using the wound method, indicates that the beadmaking methods identified in glass bead and glass waste do not match. The evidence from the chemical and microstructural analysis also does not support the assumption that these glass beads were locally made using the glass represented by the waste here. This is because (1) the raw materials are not fully consistent between the beads and waste fragments; there is an m-Na-Al glass bead but no m-Na-Al waste and perhaps more importantly v-Na-Ca glass waste has been found but no beads in this composition, (2) the colouring recipes generally do not match (e.g. such as the case of yellow glass), and (3) the manufacturing processes do not appear to be the same (e.g. such as the case of blue glass). Therefore, taking this evidence together there is a paradox between glass beads and waste here. Several factors which may explain this are discussed below. Sampling bias is one possible reason. Only a total of 36 bead samples were selected in this research, while thousands of glass beads were unearthed from Jiuxianglan. In terms of glass waste, 8 samples were analysed and around 140 pieces of glass waste were found. However, visual observation of other un-analysed bead samples suggests that most of the glass beads from Jiuxianglan appear to be drawn beads. This shows an inconsistency with the waste identified here which was produced using the wound method and the bead on a mandrel reported by Lee (2005a) which is typical of wound bead production. Thus, compositionally and structurally none of the analysed beads and waste match, and even with the relatively small sample permitted for analysis some correspondence between the beads and waste might be expected. Other possible reasons that lead to the anomaly between glass beads and waste must take into consideration the spatial and temporal distribution of the beads and waste at the site, which may suggest that the presence of drawn glass beads and wound beadmaking at Jiuxianglan may not be contemporary. Glass beads were found predominantly in the coastal area at Jiuxianglan, where it was suggested pyrotechnological activities, including glass beadmaking, were practiced. The pyrotechnological activity was evidenced by an area containing a gravel structure and burned soil (Fig. 1). A more detailed investigation into the spatial distribution of the glass beads and waste within this area has shown a more southward distribution of the glass waste (Wang 2016: 220–224). A more concentrated distribution and greater number of finished beads were found near the gravel structure and these overlap the burned soil shown in Fig. 1 (near T3P36, see discussion below). This area also contains a dense and thick deposit of artefacts and waste which may be related to other pyrotechnological activities (Lee 2015a: 140–141). In contrast, most of the glass waste was found south of the area of burned soil (trenches T3P38-T3P40). Thus, although bead production can leave little physical evidence of burning in the deposits and so might not be evidenced at either the bead or waste locations, the spatial distribution of the beads and waste suggests the two are not necessarily associated. C-14 dating of the areas near T3P36 (which shows the deposition of burned soil and dense distribution of finished drawn glass beads) indicates a period earlier than sixth century AD, while the data from T3P39 (where most wound glass waste were found) suggests a later period of around seventh century AD (Lee 2015a: 146). Thus, the inconsistency in manufacturing methods and composition between glass beads and waste in this research may be a feature of chronological differences. The evidence presented here suggests that wound beadmaking at Jiuxianglan may be a later development, and post-dates the deposition of the drawn beads, which may be imported. Without the analysis of more beads from the sites, the possibility of local production cannot be fully ruled out, although our visual examination of the other beads excavated from the site suggests these too were likely to be produced by the drawn method and so do not match the waste found. The overlap of finished beads and burned soil (which may be related to production activity) in nearby trenches, however, is more questionable and should take into consideration of the topography of this area. Figure 1b shows the inclination of the deposition and burned soil (grey area in the archaeological deposition) from northeast to southwest (in Fig. 1b right to left). This may reflect a complex depositional sequence of glass beads and burned soils as a result of human behaviour and natural formation processes. One possible reason for the inclined deposition may be the active disposal of the burned soil and the waste relating to pyrotechnology from the higher levels close to T3P36 (human behaviour) (see the grid of trench in Fig. 1a). Another factor may be the natural movement of the sand dune which may have resulted in the dumping or movement of the deposit from northeast to southwest (natural formation process) (Lee 2015a: 140–141). Therefore, the overlap of glass beads and burned soils close to T3P36 may not be a contemporaneous event but a sequential one, and considering the formation process of the site, it is tentatively suggested by the excavator that the areas near T3P36 (where the elevation is higher) may reflect the earlier deposit, while the southward lower parts may be later. This sequence of events corresponds to the C-14 results discussed above (Lee 2015a: 140–141). Thus, this additional evidence indicates that there are still more questions than answers relating to the beadmaking activities at Jiuxianglan. 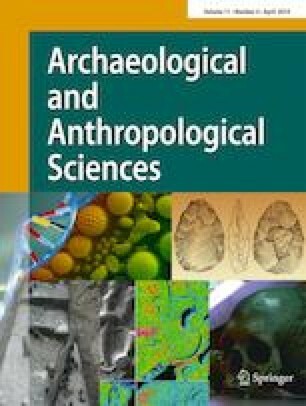 This may be partly resolved by more detailed investigation on a greater number of beads, their contexts and relationship to other finds, especially those which are related to the pyrotechnological process. Together, this will help define the role of Jiuxianglan, and any potential changes in its role in this period spanning over a thousand years. That the beads and waste do not correspond in terms of composition, style or context does not mean that beadmaking did not occur on the site at some time, just that these two sets of evidence do not seem to be contemporaneous. Another question arising from this research is the possible origin of wound beadmaking methods, such as those (tentatively) seen at Jiuxianglan. It has been suggested that most Indo-Pacific glass beads were made by the drawn method (Francis 1990), which contrasts with those produced by the wound method seen in the glass waste at Jiuxianglan. Although evidence of other non-drawn beadmaking methods have been seen elsewhere, such as Khao Sam Kaeo (mid-late 1st millennium BC) (Lankton et al. 2008b; Bellina 2014) and Khao Sek (Dussubieux and Bellina in press) in Thailand and East Java (the mid-1st millennium AD), the beadmaking technology at Khao Sam Kaeo and Khao Sek is by the cold-working lapidary method rather than the wound method, and in East Java it is the mosaic method that was used to produce the Jatim glass bead. At present, there are no other sites where wound beadmaking methods have been securely identified around the South China Sea in this period, and hence there is no evidence the technique was transferred from Southeast Asia to Jiuxianglan in southeastern Taiwan. One possible origin for this wound bead technology is China where the source of the wound method has been proposed (Francis 2002: 76–78). However, Chinese wound beads from around the South China Sea region (Francis 2002: 76–78) are generally found much later (ca. twelfth century onwards) than the date of Jiuxianglan (ca. third century BC-eighth century AD). The archaeological artefactual evidence also does not point to direct interaction between China and Jiuxianglan in the 1st millennium AD. Therefore, the potential source of the knowledge of wound beadmaking technology at Jiuxianglan remains unclear, unless it was an indigenous development. Jiuxianglan was assumed to be a possible centre of glass beadmaking and bead exchange in Iron Age Taiwan. It is demonstrated in this research, however, that the glass beads and waste do not match in terms of the beadmaking methods, raw materials, manufacturing processes and their spatial and temporal distribution. The current results seem to suggest the possibility that the glass beads analysed here were imported. This anomaly however does not necessarily rule out the possibility of bead production at Jiuxianglan at a later date than the deposition of the beads, but currently there is no strong indication that the finished beads were locally produced at Jiuxianglan. Waste glass, indicative of wound bead production, has been found dating to around the sixth century, but it is unclear whether the wound method of bead production at Jiuxianglan was a local development or the result of transferred knowledge. Through comparison to other known areas of bead production in the South China Sea region it can be seen that there were diverse methods of beadmaking practiced in local areas around the South China Sea and the evidence from Jiuxianglan may be part of this complex picture. The picture emerging from this analysis is that Jiuxianglan probably took part in the import of exotic glass beads in the earlier period and later developed bead production at the site. This may indicate a potential change in cultural, social or economic activities at Jiuxianglan within a thousand years. We would like to thank Dr. Laure Dussubieux of the Field Museum of Natural History, Chicago for the consultation and discussion during carrying out this research. Special thanks are also given to Mr. Yu-Shiang Wang and Ms. Hui-Ho Hsieh in the Institute of Earth Sciences, Academia Sinica for helping sample preparation and instrumental operation at the Institute of Earth Sciences, Academia Sinica. We also thank Dr. Hsiao-Chun Hung in the Australian National University for the advice related to the South China Sea interaction network. Thanks are also given to the two anonymous reviewers, whose comments help improve the content of this paper. ESM 1 (XLSX 26 kb).